Somebody put two stones for Daruma as feet. 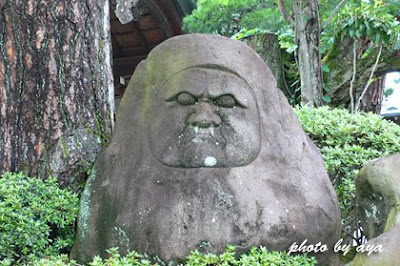 Stone Daruma from Lava, Kagoshima prefecture. The God of the Fields on the right. 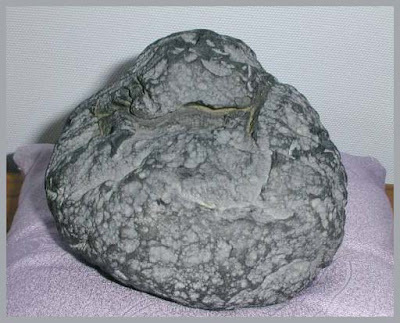 The stone comes from the active volcano at Sakurajima. 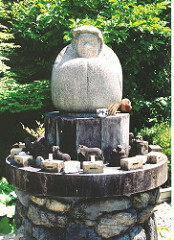 Many represent the God of the Fields 田の神 and a long-living Daruma 寿だるま. The zodiac animals are also made. They are not really carved, but scratched from pieces of lava. comes in various forms in different villages.
. 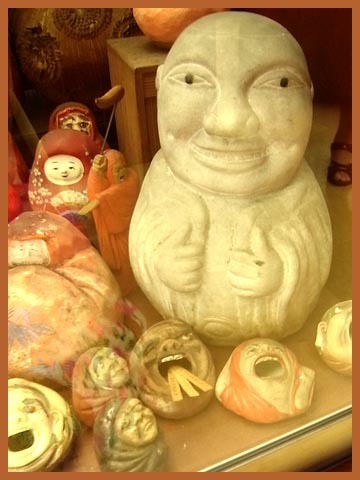 Regional Folk Toys from Japan - Kagoshima .
. Ta no Kami, God of the Rice Fields　田の神さま . This one is about 7,5 kilograms heavy. 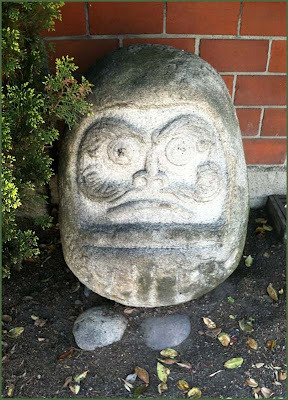 Hight 24, width about 30 cm. With a wooden stand. 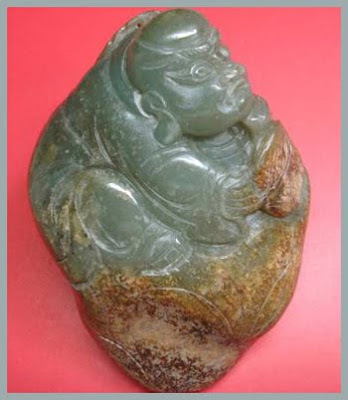 This stone weights 550 grams. 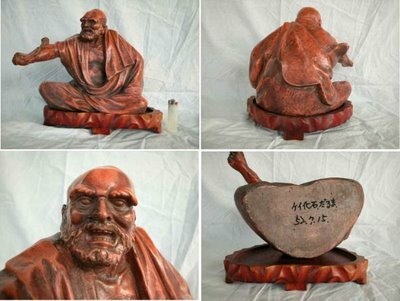 Its size is 100×73×45 mm. 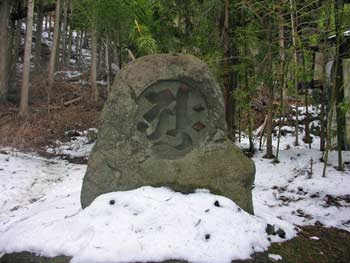 The sanskrit letter on the stone reads "aak" and is a symbol of Dainichi Nyorai. 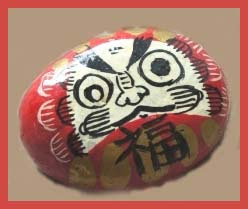 CLICK for more Ishi Daruma, Daruma Ishi ! 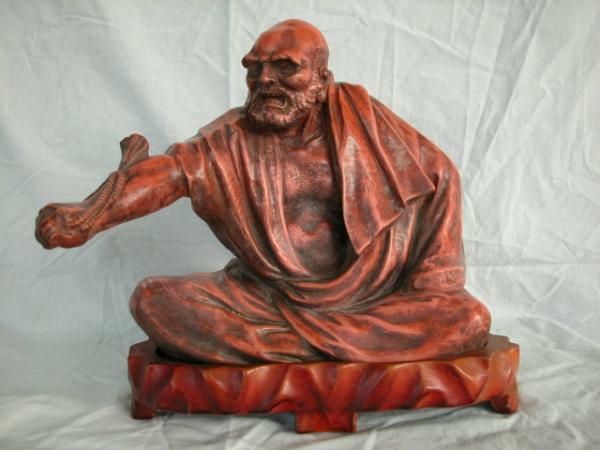 Fugai was a Zen painter/monk in the Early Edo Period. 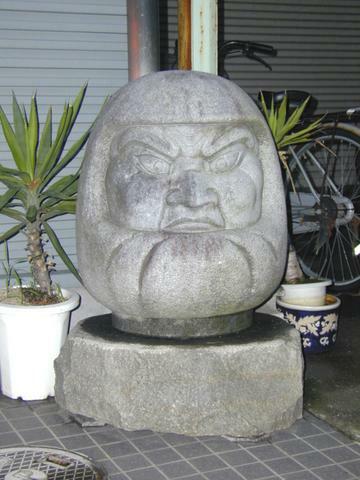 He was the head priest at temple 成願寺 in Sagami and later lived in a cave in Soga, then in Ishioka. 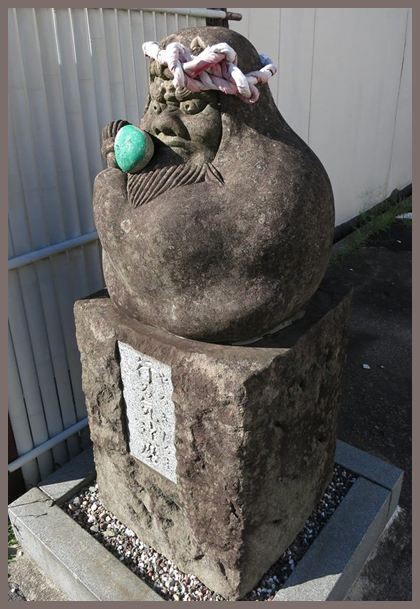 When he felt his death coming at about 87 years of age, he had his parishioners dig a hole, grabed his paintings of Daruma and Hotei and died in the hole. This is why they called him "fuugai". Fugai lived in a cave in Manazuru for a while. I have various other entries on this subject. Here is a list to them. 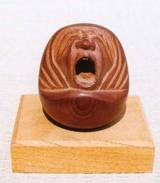 In the category of stone sculpture, a crafted image of Daruma is known as a "Stone Daruma" (ishi Daruma 石だるま). These can have various forms, from large-scale figures to smaller-scale works. 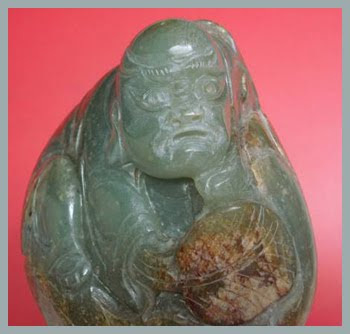 Sometimes the Daruma features are chiseled into an interestingly shaped stone. 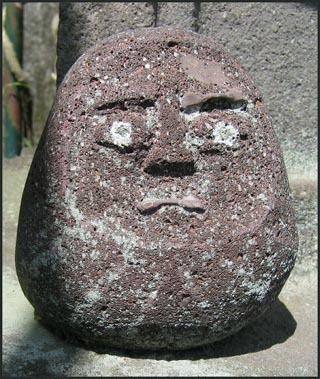 Sometimes the face is painted on a smooth, stream-worn pebble. This is a little Kannon, which I got from a friend. 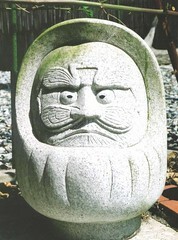 Let us look at one Daruma made of stone. He was made in China and is now sold in many stone-producing areas of Japan. I got this one near Tamakatsu from a local stone dealer. 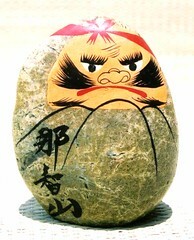 This Daruma comes in two sizes and since he is mashine-made, he has many identical brothers. 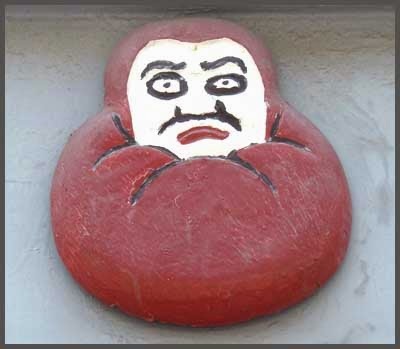 These two Daruma are painted in red and white on stone. 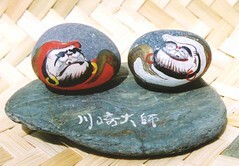 The pebbles provide soft shapes on which to paint whimsical renditions of Darumas face. These tow are sold at a temple dedicated to Kooboo Daishi, whom we have met frequently. The Kawasaki Daishi Temple is located close to Tokyo and very famous for the crowds visiting during the first three days of the New Year. I tried once to go there too and had to stand in line from the station for three hours and not yet even reached the entrance gate when we gave up and posponed the visit to February. We have already seen the pebbles from the Nachi area in the Kumano story. 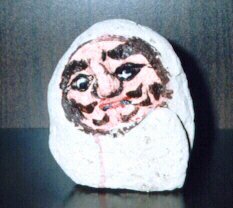 This is only the face of a beautiful Daruma of Stone, which I found many years ago in the garden of the Temple Gohyaku Rakan in Odawara. He is as big and looks just like the laquer statue which we saw in the ABC story. Maybe they were made from the same pattern? also has some stone statues, here are just two of them. 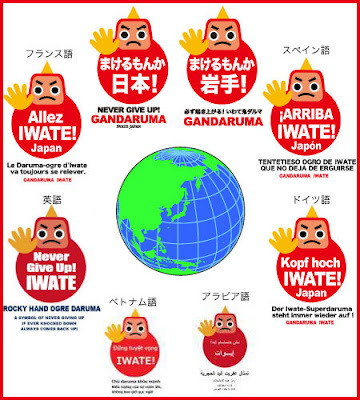 fushiki Daruma 不識 "I do not know "
The World helps Iwate prefecture after March 11, 2011. I wonder if Seymour is a chikaraishi. 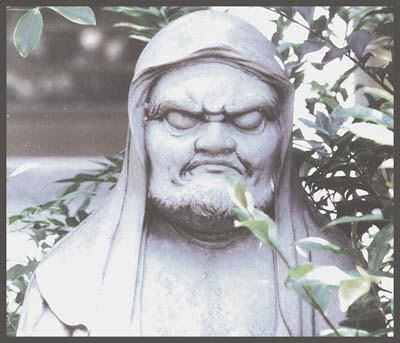 Perhaps I should make him into a Daruma-san! Surely he would like that. Jane too. that is an idea! Chikara Seymour! I can almost see him smile at this! All the best to Jane and Seymour ! 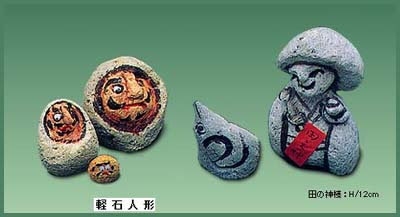 November 14th is "ii ishi no hi" (いい石の日), or "Good Stone Day."